Mac OS offers all the users with Spotlight, a remarkable tool for finding all the necessary files that you need. Be a photo or any relevant document or mail, Spotlight can certainly help you. But everything Apple provides lacks something, and therefore other software companies are developing an application to satisfy the requirements. 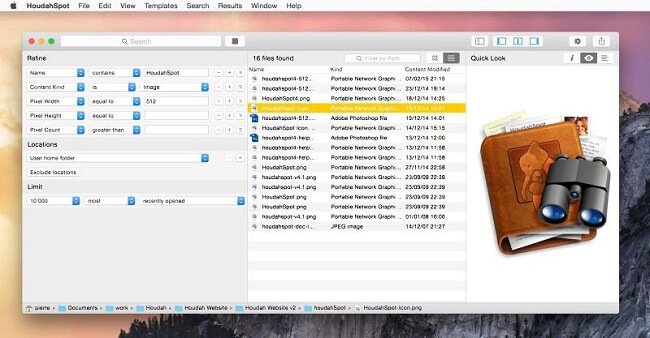 One such fantastic product is HoudahSpot, a simple yet powerful file searching tool for your Mac. It’s better than Finder or Spotlight and helps you search documents, files, photos, and emails more relevantly on your Mac device. So, let’s start the review of this fantastic software and find that how deep can we dig in our devices to find all those necessary files that stress us out at a time of submission or emergency. It is the best tool that has been helping me in every situation. Since my MacBook and Mail is flooded with so many documents, drafts, and client emails, HoudahSpot is the only thing that I’ve been using to search all these necessary stuff. Though I try to manage every document with a label, I used to end up crawl in all the folders in the drive. Maybe I’ll overcome this problem (probably), but till then HoudahSpot is the savior for me. It is powerful search tool from a leading software developer, Houdah. The company provides performance oriented programs for Mac Users, and HoudahSpot is something that you’re going to like. To test out all the reliable searching functionalities, you’ll need to install HoudahSpot on your Mac device. Though it is a premium application, the company offers a trial version for every user to test out the features on your MacBook or Mac Pro. The trial is free, and you can download it directly from the official website. Version 4.2 requires OS X 10.10 Yosemite or later, El Capitan. The minute you run the application, it will make you feel familiar with the elegant interface and design. HoudahSpot searches the entire system for every particular file you are looking forward. You can start searching the file simply and then you can refine your search by adding more relevant filters, etc. You can add columns and preview files to match the criteria. So, pick the file you need to find from your storage. The magic appears when you want to search a particular file such as a word document or presentation You just need to search the file name or the format and within seconds, HoudahSpot starts displays as many relevant results as it can. Now, to end up with the satisfied result, you’ll need to add the filters and column categories to find that particular file. You can start with the filters like date created, or file author, etc. These conditional searches are always going to work for you, and you can rely on these filters. You can easily fabricate all these searches in one filter panel, and instantly you can get all the results displayed. The search panel also shows the details of the result file. It includes the file size, type, date of creation, file location on your Mac, and the application used to create it. For example, if you’re looking for a word processing file, then you can filter the results by adding the criteria for searching for the document containing the word “report” or “Annual Project Report.” Also, if you’re searching an image file, then you can filter the results by searching such as “logo’ or 720p resolution file. Search different files by the name, text, content, etc. Combine filters to narrow down results. Specify the file search locations. Search relevant data using column. Preview all the searched file. Open files and execute using the supported documents. Press Command-G (Find Next) for text matches. Save and Use Search Templates. The application HoudahSpot is a premium offering for all the Mac users, and you can purchase the basic single user license at the starting price of $29. The license can be used on multiple devices and is an affordable deal for all the Mac users. Moreover, the company recommends all the users to try out the free trial before purchasing the license. The trial version gives you the glimpse of all the premium features that you can find in the licensed version. So, do give it a try before purchasing the license. For more details, you can visit the official website here. So, this was my take on HoudahSpot file search application for Mac, and now it is your time to tell me how do you feel about this utility. You can comment your thoughts below and please let me know if you’re going to try this search tool. It is a godsend app for all the messy people like me. Cheers!